Down to the last day of last 16 of UK Championship, 2 matches for QFs are confirmed. Today we will know the remaining four players that will be the last 8. The 2005 World Champion as well as the winner of tournament back in 2008, survived the tough test given by Martin Gould to win 6-4. The Magician had a great start for the match, leading 5-0 over Gould which was one frame away from the quarter-final spot. The Pinner Potter start his fight back with 133 to trail 1-5. After the 133 break, Gould won on the final black and to take the following two with 70 and 101. 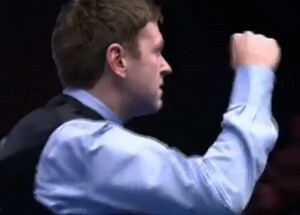 The last frame of the match that last 46 minutes was very tense, pressure were clearly shown on their pots. Eventually, Murphy potted a beautiful long yellow and cleared to the pink to win 6-4. The winner Murphy said, "I'm very, very pleased to have got through and when it mattered I managed to keep my composure. No disrespect to Martin but I played well in the first four frames and against anyone I would have been 3-1 or 4-0 up. My mistake was that I didn't carry that on after the interval and missed one ball and the game turned.Later Gould wished Murphy best of luck and would look forward their clash in first round of Masters in January. Ricky Walden earned a 6-3 victory over Mark Williams, his best win in recent years since his ranking title of Shanghai Masters in 2008. Walden made his maximum last week in PTC 10 which may boost his confidence. 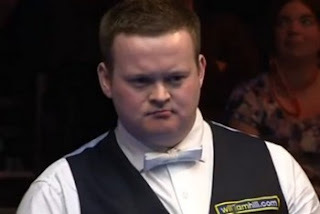 The Chester's player went 3-0 ahead of Williams with 68, 81, 85 before The Welsh Potting Machine levelled 3-3. Walden grabbed the next two with 58 and 53 to reach the match point, and made 56 to win the match despite being 5-45 behind in the frame. Walden punched the air to celebrate his brilliant win. Walden said: "I'm very pleased to beat someone as good as Mark and get to my first (BBC) quarter-final - I'm over the moon. "The celebration at the end was for my dad as I can imagine how nervous he would have been up there. He would have been really happy with that. I'll try some somersaults if I win the tournament! It was nothing against Mark - it was just for my mum and dad.'' Walden will play Murphy in quarter-finals. 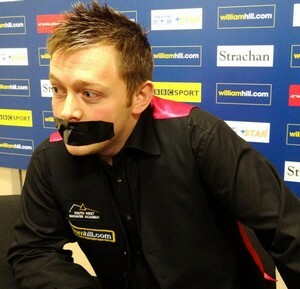 Mark Allen who involved in the press conference incident edged out Ali Carter by 6-2. Allen raised a few smiles in his post-match press conference by starting it with a piece of black tape across his mouth, but then took it off to say: "I was happy with the way I played before the interval. After that, Ali had chances to get back to 3-3, but I made a couple of good clearances to go 5-2 up. Hong Kong cueman Marco Fu stunned World Number 1 Mark Selby to reach the quarter-finals by a 6-3 win. Fu took the opening two frames before Selby levelled with 102. Selby grabbed a chance in frame 5 but broke down at 53, Fu nicked it with a clearance of 64. The Jester from Leicester reduced the gap to 3-4 but Fu taking the next two frames including 85 break in the last frame to clinch 6-3 victory.